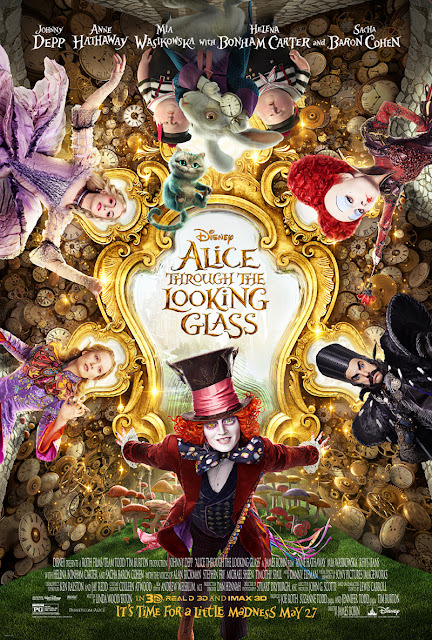 CherrySue, Doin' the Do: Alice Through the Looking Glass - Movie Review! I think I like Burton's Alice films mostly because they feel like American McGee's Alice which I absolutely love, just with brighter colours. But then again, I do have navy hair and wear mainly dark colours so it's basically law in my world. This film is GORGEOUS. The colours were breathtakingly vibrant, even through the dark 3D glasses, even the darker colours had a navy tinge, making them pop. The 3D itself really worked at the start, huge planks flying through the screen and rain falling like it was in the cinema looked great, literal 3D; which has been sadly lacking in most every film with that title in years. Unfortunately those effects were more limited as the movie rolled on. 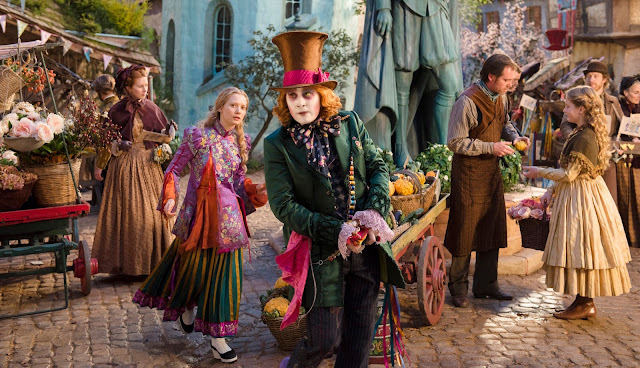 As we've come to expect with Burton, Alice Through the Looking Glass is VERY dramatic. Evoking a stage play feeling for me, making the entire production more coherent and ultimately funny. Johnny Depp wasn't quite Jack Sparrow levels of kooky, but he was just the right level of Willy Wonka to play Mad Hatter. I, again, didn't like Alice herself, she was bland and had a constant Resting Star Wars II Anakin face (it's a thing). Sascha Baron Cohen as Time felt almost there, he was like a pantomime villain but I just couldn't get on board with the German(???) accent, it grated almost as much as Helena Bonham Carter's screaming. His Seconds minions were really well done and clever though. Especially comical were the scenes with Time and the attendants of Tea Time, it seemed almost effortless, you could tell they had all the fun filming. I can completely understand why people won't like Alice Through the Looking Glass (Yes, they really shove the name down your throat) but I preferred this to Jungle Book which I loved - Jungle Book reminds me of Avatar, gorgeous and all but a one time watch, while I'll gladly see this again. I also recommend the 3D (which I VERY rarely do). The high saturation cuts out the dark tint of the glasses, which really adds to the film, unheard of for the much hyped, seldom delivering medium. P.S. The credits are really interestingly done as a sketched animation style (the song is ATROCIOUS though), so stick around for those!